Twice in the past month I’ve had word issues with a book I’m reading. No, it wasn’t that the author was using words only found on the SATs (not for long it seems since they’re doing away with the vocabulary section) and word-of-the-day toilet paper. In one book it was words made up by the author (don’t we all have a little of Will Shakespeare in us?). I can understand his reasoning as it was a moose doing the talking but the problem is, I’m not fluent in Moose. In the other book it was regional word and sayings from a region that I’ve never visited. If you think about it, many of the books we read have words we’re not familiar with in them. It isn’t just the science fiction/fantasy books that involve an entire created world and language that introduce us to new words. Many genres (I’m seeing it more in YA and middle readers) are introducing a new word to replace one that may fall out of fashion (like tweeting or i-phone) before a book gets to publication. There are the occasional smatterings in Latin or another language by a character. I think we can thank Agatha Christie and Poroit for that! There are regional and time period specific words or saying that weave their way into our fiction. Then there is technical jargon or language specific to a profession. It’s a wonder readers understand anything! So what’s an author to do? I ask this question because I’m writing a novel set in World War II and a specific region and lots of words not in everyone’s personal dictionary are popping up. Target Your Words – For me this means going through my manuscript highlighting words I think might be trouble, asking beta readers to highlight words they don’t necessarily understand and sending paragraphs containing these words to people who don’t live in the region where the book is set to see if they can guess the meaning of these words from the context. Explain – Once you know which words might confuse readers make a conscious effort to add definitions for the words the first two or three times they are used in your book. Not literal definitions, but try to drop hints about the word’s meaning through the characters actions, the setting, or descriptions. Go light on the actual descriptions and spread all these explanations out. I once read a book that seemed to cram a life’s worth of knowledge of thoroughbred racing into four pages at the beginning of the book disguised as one character giving another a tour of the track. The pages dragged. Give Literal Definitions – This can be done several ways. One character can be designated as the “I don’t know what everyone is talking about” guy. Whenever someone blurts out a confusing word he can look at someone with a bewildered look or even come right out and ask for an explanation. This seems to be most effective when you have an outsider – someone new to the area, a private detective, even an older character – who we can believe doesn’t know what everyone else is talking about. But this only works a few times before it gets repetitive. Lexicon – What if after your manuscript search for confusing words you find you have a list of a dozen or more? It’s difficult to slip definitions for a dozen words into a book without upsetting the flow of the plot. In that case you may have to resort to an actual lexicon, a list at the beginning of the book that is separate from the actual story that lists words and definitions. The last thing we want to do is leave our readers clueless. So when it comes to unusual words find a way to clear up the confusion. Your readers will thank you. How do you as a reader prefer that word confusion be eliminated? Jodi Webb is still toiling away at her writing in between a full-time job, a full-time family and work as a blog tour manager for WOW-Women on Writing. Right now she's looking for blogs to promote Barbara Barth's debut novel Danger in her Words. You can contact her at jodi@wow-womenonwriting.com. For Jodi's take on reading and writing (no 'rithmetic please!) stop by her blog Words by Webb. I actually don't have much of a problem with it, and I'd rather writers didn't take TOO much flavor out of their work by avoiding unusual words. 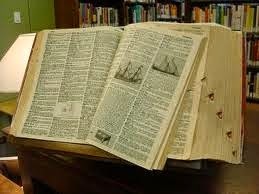 When I was a kid, they taught us to look up every unfamiliar word in the dictionary. I never did that -- just read past it and picked it up from context. Actually I don't have much of a problem with it. Maybe I'm just lucky. :) To me, context is all. On rare occasion it may take me a chapter, even two, before things fall into place. No big deal as far as I'm concerned. If I really like it I'll be reading it again. . .and again. If I don't, learning a new word is a non-issue. Like Susan and SE I generally pick up the meaning of a new word via the context, but the ability to do that depends on the genre. My Dad reads a lot of books with "ten dollar words" and will often sit with a dictionary nearby. I tend to read fantasy/sci-fi; in a book with made-up languages, etc...I prefer a Lexicon. If the words are made-up or so rare that only the expensive hard cover dictionary will have it, I think it's better to not use the word or to give the reader clues to the meaning. Once in a great while there comes a word which is perfect to use, but is so specific that no other words will do and that the definition is another twenty words long. In those cases- I say use the word. People will either skip past it or hunt it down on the web.